First off, I've seen the headsets named as G4ME, and mine's boxing has it labelled GAME, so I think it's safe to refer to it either way. I didn't buy mine with gaming in mind, I don't play those kinds of video games, my interests was with with intercom and telephony purposes. I occasionally use VOIP, but didn't have anything really good for it. And we do video production work, where good intercom headsets are needed. I've been using beyerdynamic DT109 headsets, but they have some significant drawbacks and flaws (the microphone is not noise-cancelling, so you get a lot of background racket getting into the intercom, more so when you have several headsets on a party-line intercom; the microphone is not shock-mounted, so any bumps to the headset, anywhere, make annoying noises; and the earcups keep sliding down the headband, while you're wearing them). So, I thought I'd have a look at these headsets as a potential alternative. First impressions are that they are comfortable to wear. The earpads, and headband pad, are a soft plush velvet material. The pressure it uses to grip onto your head is enough to hold them in place as you look around, and up or down, but isn't crushing. And the weight is reasonable. 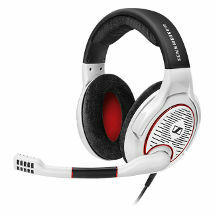 They have good sound quality, the headphones sound similar to other Sennheiser headphones, when listening to music. And while the earcups go completely around the ear, with the ear pads resting on your skull instead of squashing your ears, they don't block out the ambient noise around you very much, hardly at all. In practice, you won't hear much around you if you were listening to music, because it would drown out the ambient noise. But if you were listening to speech, you could hear what's going on around you whenever the speaking stopped. Depending on your needs, this could be useful, or detrimental. The Game One headsets are an open earpiece design, you won't have to take headsets off to talk to someone near you, and the lack of accoustic sealing means your ears don't roast as much as sealed-in headsets. There's a similar Game Zero headset which has a closed earpiece design, with leatherette earpads. That will give an accoustic seal to the earpieces, blocking out a lot of ambient noise, and keeping in the headphone audio (people nearby you won't hear what you're listening to, so much). But you'll get hot and sweaty ears (thanks to the material, and lack of ventilation). That's something that I'm only prepared to put up with when I have to, such as when working in very noisy environments. Though, pleather earpads are useful if more than one person will use a headset (you can easily wipe clean pleather earpads, and put removable hygiene covers over the top of them), whereas a fabric earcover will absorb sweat and grime. I've read other review comments about the headsets being more attuned to music listening that gaming, because they lack some tone controls, or bass boost, etc. But it's far more practical to make headsets be high-fidelity (accurately reproducing audio), so that they can be used for any purpose, and let the user play with tone controls, etc., on their amplifier, to create the type of abnormal audio they prefer, instead. There's a volume control built into the right earpiece, it controls the left and right volumes simultaneously. It's convenient to have it there, rather than in the middle of the cord. It doesn't go all the way down to completely off, which has the advantage that if you didn't realise the volume control was turned all the way down, you can still hear some audio. There are three common problems with volume controls on headsets: One being that left and right levels mightn't change by the same amount, simultaneously, while you adjust the levels, though I can't say that I noticed that happening with these. That people turn the headphone volume control down, then the amplifier volume control up too much, attempting to compensate, driving the amplifier into clipping. The other being that volume controls can get crackly and unreliable over time, particularly if DC voltages get into them (which can easily happen, when you accidentally plug headphones into computer microphone sockets; and some headphone amplifiers have DC coupled outputs, with a non-zero DC voltage on them). The microphone does actually appear to be a real noise-cancelling microphone (one that rejects most ambient noise, requiring that whatever you want the microphone to pick up has to be very close to it), in the tests that I made. A lot of headsets claim this, but can't really do so with any integrity. It's often an outright lie, and their microphone is an ordinary directional, or even omni-directional microphone, and they rely on your computer to play auto-muting tricks to try and shut-up unwanted noise when you stop speaking. They don't do that very well, and there's still a lot of racket getting through while you speak. On that note, I wish phone manufacturers would put proper noise cancelling mikes into mobile phones, I'm sick of trying to pick out what someone's saying to me when they're in a noisy environment. The microphone's sound quality is quite good. It's better than most cheap headset mikes, and even some quite expensive headsets—it's not tinny, and not very clunky when you move about. I don't think it's quite good enough to use for professional recording purposes, but it's better than you'd expect for communications work. My test recording sounded a lot better than some others that I've heard, when they plugged their headset straight into their video camera. But I suspect they probably still had the wind noise filter switched in, and that can severely cut down on the bass frequency response. The mike has a grill at the front and back, the sides are enclosed. You can see there's some small amount of padding, or fabric, behind the grill, but no real pop-filter. For what it's worth, microphones that are close to the mouth are best spoken past them, rather than directly into them, anyway. You don't pop them so easily, nor fill them with spit. For that kind of reason, it could do with being a slightly shorter boom arm, to place it beside your mouth, and get it away from being blown into when you breathe through your nose. If you're one of those people who pop into microphones, or end up spitting in them, you can easily put a foam windguard over the top. Not to mention that external windguards are very easy to replace for hygiene purposes, but internal ones are next to impossible to replace. The mike boom arm swivels to just below your chin, and up to the headband. The mid section of the boom arm is flexible, so you can move it further away, or closer to you. You're stuck with it being on the left side, the headphone design doesn't cater for wearing it backwards to put the mike on the right. While not usually a problem, some people have a fetish about which side it should be on. And for anybody wearing headsets while shouldering a camera, they usually need to make sure mike boom arms don't clonk into the camera when you turn your head to the right to do something with the camera. There's a mute switch built into the headset, so that the microphone is muted when you push it up towards the headband. It's a very simple thing that more headsets should do. It gives you an easy way to shut unwanted noise out of a communications circuit, or to have a private conversation. They came with two cables (it detaches from the right earcup), one has the usual two 3.5 mm computer mike and earphone connectors, the other has the four-pole 3.5 mm connector used on some equipment (e.g. some phones and game consoles). They have that braided fabric cover that's all in vogue at the moment, but's that kind of thing's a nuisance if it gets dirty or starts to fray. On the whole, it seems to be better than my existing comms headsets, though I don't relish the thought, and expense, of replacing around half a dozen headsets. And I don't know how robust these headsets will be, yet. They're, pretty much, an all plastic contraption, and the pivet points for the earcups don't look like they'll cope with the hamfisted operator who doesn't care how he treats someone else's headsets. Written by Tim Seifert on 19-Oct-2015, and last updated 03 Jul 2017.